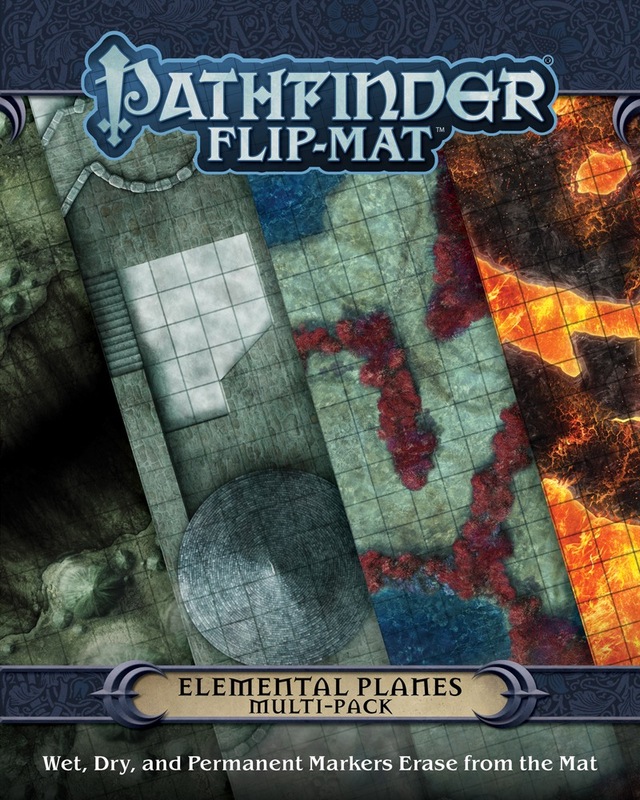 Bring your players to the great beyond with Pathfinder Flip-Mat: Elemental Planes Multi-Pack! 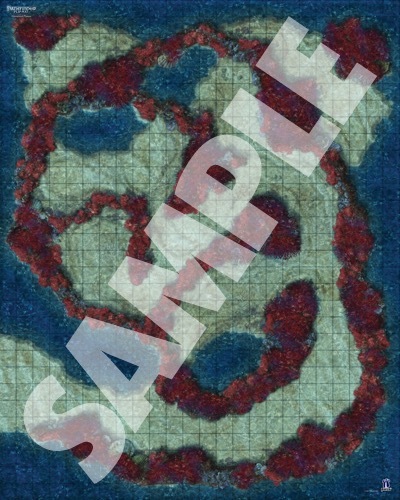 Each side of these two Flip-Mats depicts an exciting location on one of the Elemental Planes. From a coral reef cave on the Plane of Water to volcanic wastelands on the Plane of Fire, and from a cloud castle on the Plane of Air to a stalagmite forest on the Plane of Earth, wonders and perils abound. Pathfinder Flip-Mats fit perfectly into any Game Master's arsenal, giving you vibrant maps you can use again and again! Don't waste your time sketching when you could be playing. With the Pathfinder Flip-Mat: Elemental Planes Multi-Pack, now you can focus on what matters the most: the action in your game! 3 VERY beautiful maps & 1 ok one. As i thought (and as it is usually with all of them), these maps look MUCH better in real life! Especially the colors on the volcanic map & coral map are much deeper. The "stalagmite forest" is my favorite, as it can easily be used as a Darklands encounter, but also as a location in a mountain range on the material plane. The 5 squares long and 2 broad bridge over a deep and broad chasm is especially cool. Number two on my list is the "volcanic wastelands" map, something that i didn´t think when i first saw the preview image. It is incredibly beautiful and could be used for a real memorable battle on another plane, like Hell or the Abyss or in a volcanic environment. Number three is the "coral reef", a special location, but quite gorgeous and of great use in an aquatic campaign like "Skull & Shackles" or the upcoming "Ruins of Atzlant". I still don´t like the "cloud castle" map much, that hasn´t changed from the preview art. 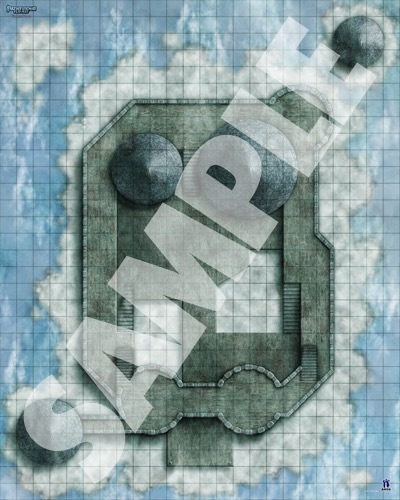 It is much too small for a castle (more of a guard post), the four tower roofs limit the usability and especially the surrounding area of clouds make this map hard to use in most situations. It could alternatively be used in an icy environment though. It is not ideal to offer this map pack in the regular map subscription, but the price for two maps isn´t double, but only two thirds higher and i can see the reasons for doing this from Paizo´s business standpoint. This map-pack is worth buying in my opinion, as the "earth" map can be used in every imaginable scenario, and all of the other maps are so generic that they could be used in at least one other environment. This multi-pack is a hit, not a fail! Also useful for AP #20 - "Ironfang Invasion" and the "Pathfinder Campaign Setting: Elements of Power"! Should this have the "not part of the subscription, but subscribers who preorder get a free PDF" Bit? Oh man, I'm super excited for this map pack - especially for PFS shenanigans! 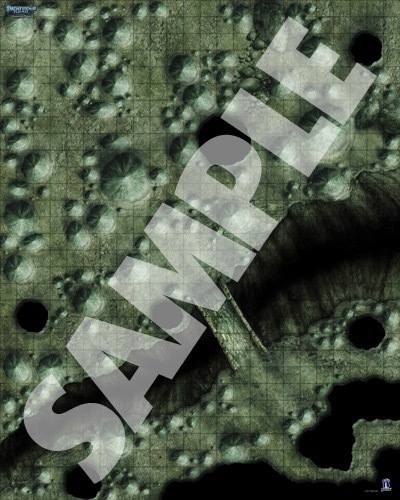 Note:This product is part of the Pathfinder Maps Subscription. Glad to see the shift in pricing for a subscription product isn't seen as a no-go as much as it used to be. I think the subscriptions generally benefit from that added flexibility (from time to time). Why is this set part of the subscription?!? These are so specialized that anyone that does not play Pathfinder or another of its ilk has no use for it. I know I have no use whatsoever for these and now I am going to paying $25 for maps that will sit in my map case doing absolutely nothing for all time. That is unless I pay eBay or somewhere else a pretty penny just to get a portion of that money back. This is one of the rare times I am completely and totally disappointed with being a Paizo Map Subscriber. I know it's a bit of a hassle, but you can ask Customer Service to cancel your sub in December after the Armada Map Pack and then restart it yourself once these have shipped in January. You're not forced to buy them. Looks like an awesome idea. So this multipack brings 2 different flip mats? Well, I usually buy most of the map packs but very few of the flip-mats, so a subscription does not make a lot of sense. I may consider subscribing if I like whatever map pack comes after this one since that would mean that I could be buying at least three map subscription products in a row. I was informed last year by a Paizo customer service person that doing that was against the agreement that one accepts when one becomes a Paizo subscriber. Since I find most of the Map subscription adaptable to the game I do play, I rather not lose my privileges. In this day of such computerized automation, a subscriber could reasonably expect a button or some other such 'device' where one could push/toggle/whatever it a reasonable time before the release day (e.g. 45 days afore) and not half to take every map idea that comes across the developers' minds. You make no sense Milo. As well as seas in both. Every piece of mapping other than one has been useful in the one game I play. That was when I was told what I was told by the Customer Service agent. What point were you trying to make Milo? It seems to have no connection really to my issue whatsoever. Hmm. I'd definitely ask once more - I know many people opt-out of the Campaign Setting subscription whenever a map folio comes around (for example). It's not too much to ask - many people have asked (and been told yes)! It may be against the spirit of the subscription if you were to subscribe for one thing and then cancel immediately (or more likely, if someone tried to subscribe, back-order-with-a-discount and then cancel without receiving any subscription item). However, I am very confident you are able to cancel a subscription at any time - even if you then resubscribe after missing only one item. Definitely worth clarifying with them (although I presume one of them will chime in on Monday). I suspect there was some misunderstanding when you spoke about it last year. You were saying that this map set is useless outside of Pathfinder, which is ridiculous considering that floating castles, giant cave systems and seas are in tonnes and tonnes and tonnes and tonnes of fantasy fiction. Thus the facepalm. I'm not sure where you heard this, because it isn't true. There is no "agreement" you enter into when purchasing a subscription beyond giving authorization to automatically charge your card as new products are released. People cancel their subs and then resubscribe later all the time, whether it is to skip an AP they don't like, or to skip the Map Folios in the Campaign Setting line, or to skip the Base Set in the Adventure Card Game because international shipping on it is absurdly expensive. You just need to contact Customer Service and let them know you wish to cancel the subscription, and then you will need to remember to re-subscribe after the next product you care about becomes an option on the subscription page. When purchasing a new subscription, I only see the following text: "This order will start a subscription. Subscriptions generate new orders as products arrive at our warehouse until you contact customer service. Your subscription products will be shipped once a month. Any non-Paizo subscription releases will wait and go out with the next monthly Paizo subscription shipment." I am not asked to sign any other sort of agreement, nor are there any links to other agreements that apply. In any case, I wouldn't dismiss this one out of hand just yet, wait until you see what the images look like. The water and earth ones may be relevant to your worlds as a general seafaring map (or underwater map of some sort, depending on what it looks like), and the earth one may as well be a generic underground dungeon. The air might work for floating cities or the like, and the fire may work for a volcanic lair. These are just guesses on my part since I haven't seen the images either, but don't think that they aren't immediately applicable to a campaign that never visits other planes. I can absolutely understand, that for some people it is ok to pay $10 more a month and for others it is not. Personally, i wouldn´t do multi-packs or other items that have a higher price as part of the subscription, the "Bigger" maps only cost $5 more and aren´t part of it too. "Each side of the Flip-Mat depicts an exciting location on one of the Elemental Planes. From the haunted depths of a primordial sea on the Plane of Water to the obsidian-shod wastelands of the Plane of Fire, and from the floating fortresses on the Plane of Air to the stalagmite forests on the Plane of Earth"
Until the sample art comes up, there is no 100% sure way to know if the flip-mat is usable for the personal preferences of a subscriber or potential buyer or not. I agree with the reasonable time comment of roughly 45 days though. Most of the time Paizo is able to show stuff 2 months or more in advance, some few times it is too late (like with the "Lost City Flip-Mat recently). Stalagmite forests on the Plane of Earth sounds especially like a map that could see a lot of use, depending on how it´s done. But then, the same is actually true for all of them, plane of fire maybe the most difficult to put to use. Along with the hints of the new AP and PFS visiting the planes, i think this will definately be a good product though! No idea who said you can't drop subs to avoid items. They're completely wrong. I've done it multiple times and can point you to the customer service threads to prove it. Meanwhile, I will likely subscribe to the line in January just to get these maps. Of course you can subscribe, unsubscribe and then resubscribe again. The point is: it's bothersome. If you have to check every month if xou want a product or not, write e-mails, wait for a response and check your shipping mails and credit card data, it is an effort and takes time. This is only a problem if a subscription line offers different kinds of products, like for example the Player Companion line, which has 10 books a year and 2 map folios. Some people don't want the maps, some do. It would be a great option if you could select -maps only, -books only or -everything. It's even worse with the map subscription. Personally i love the flip-mats but hate most of the map packs. These should be separate lines imo. I don't like the "Bigger Flip Mats" (good idea, bad execution), but they are not part of the line. Multi-packs are. Ok, this is only the 3rd multi pack in the line and i liked the Basic Terrain one, but not the Thornkeep multi pack. That was not the point User7866 made. It was a part of what he said. His main point was that he didn´t want the price increase (which i see exactly like him) and he feared to loose some privileges. His second point was, and i quote: "In this day of such computerized automation, a subscriber could reasonably expect a button or some other such 'device' where one could push/toggle/whatever it a reasonable time before the release day (e.g. 45 days afore) and not half to take every map idea that comes across the developers' minds. Is this really too much to ask?" The trouble is that we each have our own level of granularity (I'd love to be able to get two of the map folios and only one of the campaign sourcebooks, for example. I'd also like to be able to double-up on some categories of the player companions but not others and to pick up AP pawn sets but not the big boxes). Paizo don't have the luxury of catering to just one set of needs though and have to provide a 'one size fits all' approach that they judge will be most appropriate for the market - the fact they allow such easy opt-in-opt-out process (it's really not that bad - one phonecall or one email and it's done) really mitigates any 'gotcha' moment. They telegraph out of the ordinary items several months in advance, plus they email you a personal we're-about-to-ship-you-this-item warning a few days before it's actually finalised, so you can always get onto them and say "Actually, not that one thanks". The current setup invites you to stick with the line and perhaps pick up the occasional thing you wouldn't otherwise have selected - but doesnt actually force you to buy anything that you really don't want. If it was ultimately customisable as you suggest, it would be less of a subscription and more a case of 'click these buttons and we'll give you a discount and a free PDF with no ongoing obligation'. Ultimately, the advantage of the subscription model for paizo is that they get a good idea of the number of people interested in particular products and, over time, can judge print runs accordingly, secure in the knowledge that they have a reasonably stable base-line of sales on release. That would become less useful to them if everyone (even casual purchasers just looking to buy one thing) were able to effortlessly 'subscribe', get the thing and then pause their subscription for some indefinite time. Suddenly, the number of map subscribers doesn't really indicate much at all about how many are likely to buy next year's releases but rather how many have ever bought something direct from paizo with a subscriber discount at any time in the past. We can cancel a subscription any time. I don't know who told you we could not cancel a subscription or that there was an agreement you would be breaching, but that is not correct. We don't have a way to skip specific items in a subscription but usually suggest that if someone does not want a specific item to have us cancel the subscription and then they can start a new one beginning with the next item they do want. Did you want me to cancel yours? Sorry for the delay in answering; I am not usually here plus I have had some health challenges recently. I would not want to cancel right now because I would then lose all my priviledges between now and January. Someone pointed out that I should wait until the preview pics are up. Another pointed out that the maps may not be as "bizarre" as the title suggests and will be far more useful than imagined. Thank you Diego for the offer. At this time, I would like to defer doing so. 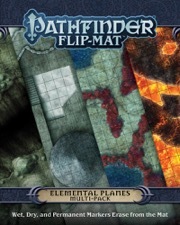 I take it that this flip-mat pack is coming out in January for this Pathfinder Campaign Setting: Planes of Power that I just got an e-Mail about!?! When are we getting previews? The Campaign is out so the maps are complete, yes? So there should be images. Especially so when they want us Map Subscribers to be willing to spend twice what we normally do. I wouldn't expect a preview until November or so. We got the art update on september 10th for the october 19th and november 16th map products. I would expect the update for the december 14th map product sometime in october, but the exact date is variable. That said, the sample art for the january products could come anywhere between october and early january, as the x-mas/new year season is a little unpredictable. The elemental planes maps are not shown inside the "Campaign Setting: Planes of Power", they are thematically connected to it, as well as to the actual "Pathfinder Society Season" (8 i think) and to the upcoming "Ironfang Invasion" Adventure Path. Flip-Mats and map-packs are mostly connected loosely to other Paizo products, often not at all. There are adventures that use them, but only after they are out, not the other way around. The only expectation that comes to my mind is the "Town Square Flip-mat" for the RotR AE and to lesser extent the "Asylum Flip-Mat" for AP#109. Future Pathfinder Society scenarios will certainly use them, once they are out. I bet the coral reef looks better in reality. The volcanic maze looks useful. The earth forest is great for the Darklands. Only the air fortress looks a little small and bland. Will be going into the very back of the map folio. And at what a cost!! Or will I be selling my first item about a decade and a half on eBay? Might be my first item for sale in the 21stC there. Need to recoup some of this outrageous cost for nearly nothing in some fashion. You can opt out of these two maps via customer service if you think the cost is outrageous. Then you don't have to recoup anything. I propose that we rename the front of the Deep Forest flip mat to "Material Plane".